Expect a primary offering of 60s Club Soul, 60s R&B, Northern Soul, Funk, Mod Raves, 60s Garage, Boogaloo and Exotic Delights. 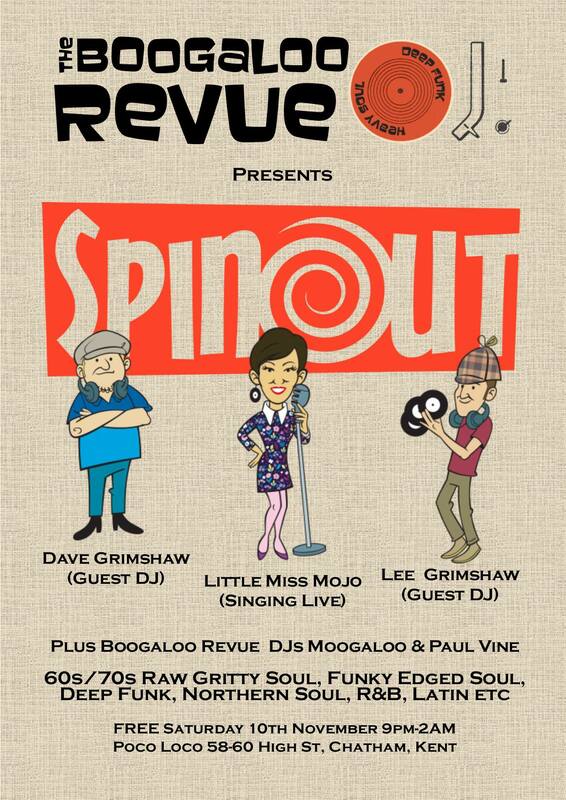 Spinout often includes a live vocal performance from Little Miss Mojo – amongst Lee’s record collection are authentic backing tracks, where Little Miss Mojo provides the soulful vocals in order to bring the record alive. Recently the revue was showcased at Boardmasters Festival, Looe Music Festival, Shiiine On Weekender (Butlins, supporting Freakpower, The Fay Hallam Group, Corduroy and Blur’s Dave Rowntree’s DJ set), Pop Gallery, High Rollers Weekend (Las Vegas) and various venues in Cornwall, including both DJ’s and bands. © 2018, moogaloo. All rights reserved.